Tibetan Rugs are renowned for their vibrant colours and luxurious feel. Our Tibetan Collection can be custom woven to meet any size, colour and design requirements. The finest quality wool, silk, aloe, hemp and pashmina as well as other organic materials are combined with a variety of expert weaving techniques to produce exquisite hand-woven rugs. We have a long standing relationship with a Buddhist community of Tibetan weavers based in Nepal who produce our collection. Dining Room by Richard and Roger - designed by Roger Ward - Tibetan Collection - Silk Twill Stripe. 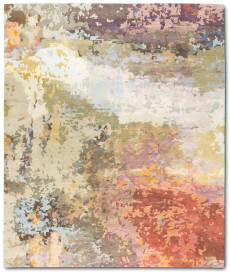 Rug Star Collection - Eden no. 9 Design - wool and silk, hand woven in Nepal.